iTunes is probably one of the handiest tools that has been designed for Apple users and offers a decent overall software experience. However, iOS users may face some bugs and issues from time to time when using it and one of those issues is the infamous iTunes error 45054 . The causes for iTunes error 45054 are unknown. You can try the common solutions but it takes time and possibly be in vain. Instead, you can take advantages of iMyFone TunesFix - the ultimate iTunes repair tool - which repairs 100+ iTunes errors in just one click, without any data loss. Solve iTunes connect issues: iTunes could not connect for invalid response/missing value, error 0xe, iTunes not detect iPad, etc. Fix iTunes Install/Update errors: iTunes/iTunesHelper was not installed correctly, installer has insufficient privileges, error 2, error 126, etc. Repair Backup/Restore issues: Backup was corrupt or not compatible, backup session failed, etc. Solve other unknown errors: iTunes won't start, iPhone won't be restored/updated, error 13, error 4037, etc. Step 1: Launch iMyFone TunesFix on your computer and it will detect your iTunes. Step 2: You will be brought to its home interface if iTunes is complete. (Or you can repair iTunes components issues if there are some issues.) Choose "Fix Other iTunes Problems". Step 3: Click "Repair" and wait for it to fix your iTunes. Clean iTunes files, including media, old iOS backups, used iTunes/iOS update files, cache, logs, cookies, etc. Completely uninstall iTunes and any of its reference from computer without leftovers. There are many fixes for iTunes error 45054. You should try them one by one until the error gets fixed. Sometimes disabling unsupported program features fixes such errors. You can try it and see if it helps. Step 1: Right click on iTunes shortcut from desktop and choose Properties. 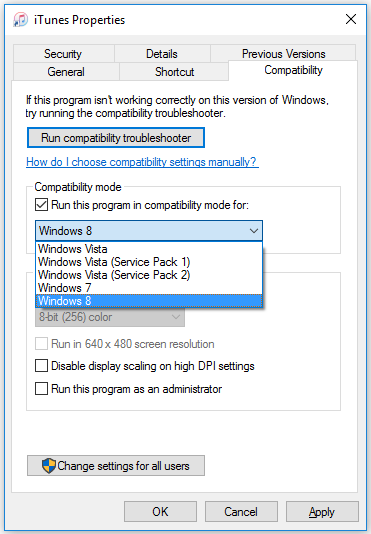 Step 2: Now click on the Compatibility tab and select an earlier version of Windows provided in the drop down box. Step 3: Click OK to save your changes. You can try fixing the error -45054 via iTunes’ built-in diagnostic/troubleshooting tool. 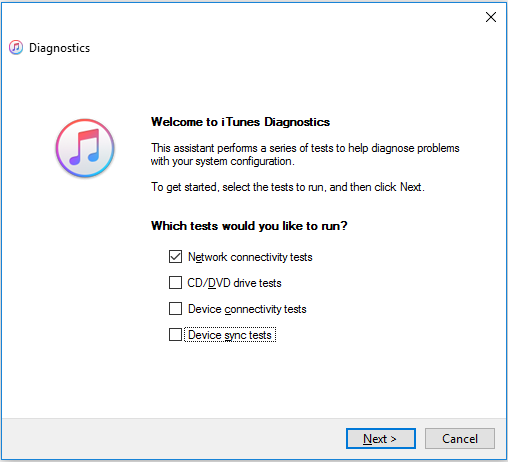 Step 1: Launch iTunes and select Help > Run diagnostics option. A new window will open up. Step 2: Check-up Network connectivity tests on the newly displayed window. Click Next and follow the given instructions. Sometimes the cause of error -45054 is a subfile in your iTunes. Deleting the SC Info folder and adi folder can solve this error. Step 1: Quit iTunes and launch Run from Windows Start menu. Step 2: Type "%ProgramData%" in Run and press Enter. Step 3: Navigate to iTunes folder, it is located in Apple Computer folder. Step 4: Delete the SC Info folder and adi folder. And then restart your computer. There could be several reasons for iTunes error -45054. Some of the known reasons include corrupted iTunes related programs files or Windows systems files. 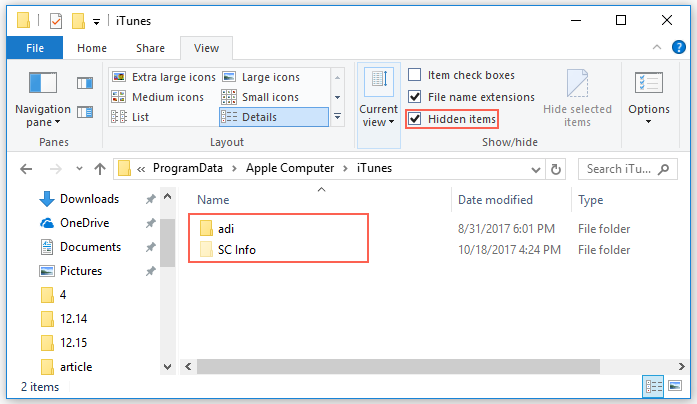 Changes in the registry files or missing or deleted iTunes-related files. It may also occur due to bad iTunes software installation or improper uninstall of iTunes before installing a new version, etc.